THERE HAS BEEN a wave of hate crime, assaults and racist incidents reported in Britain since the Brexit result. The UK’s decision to leave the EU was stated during many of the incidents. 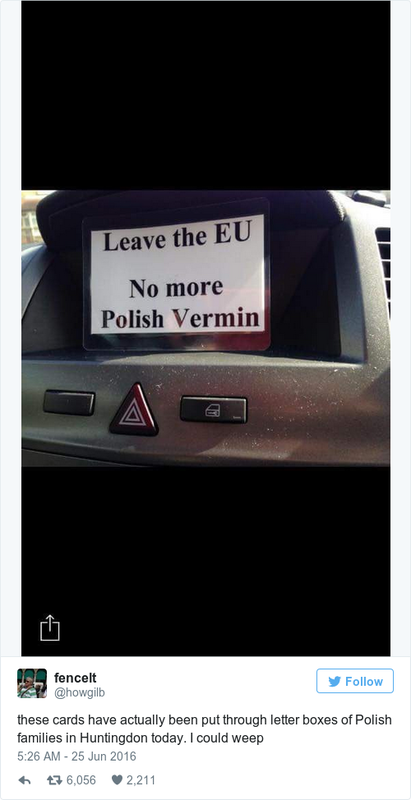 In Huntington, Cambridgeshire, signs have been posted through the letter boxes of Polish families, stating, “Leave the EU, no more Polish vermin”. It’s also reported that children are being targetted with these notes being distributed outside primary schools. The cards were in both English and Polish. Meanwhile, Metropolitan Police in Hammersmith and Fulham are investigating after offensive graffiti was daubed on the front of a Polish Social and Cultural Association. The London mayor Sadiq Khan has placed the city’s police force on alert. Addressing the incidents, a spokesperson for Prime Minister David Cameron’s said the government “will not tolerate intolerance”. We should be absolutely clear that this government will not tolerate intolerance… intimidating migrants, telling them they need to go home. 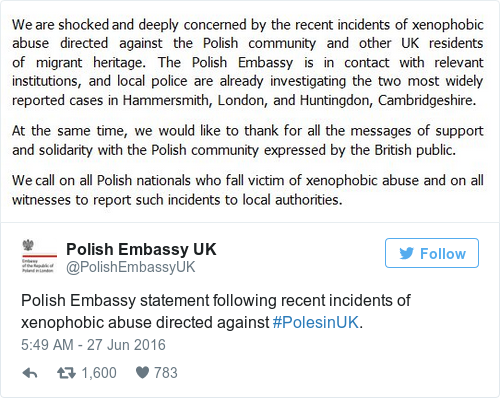 The Polish Embassy in London said it was “shocked and deeply concerned”. A Facebook album called “Worrying Signs” has been created to document the incidents that are being reported. Scenes of anger and hatred on Britain's streets after Brexit. 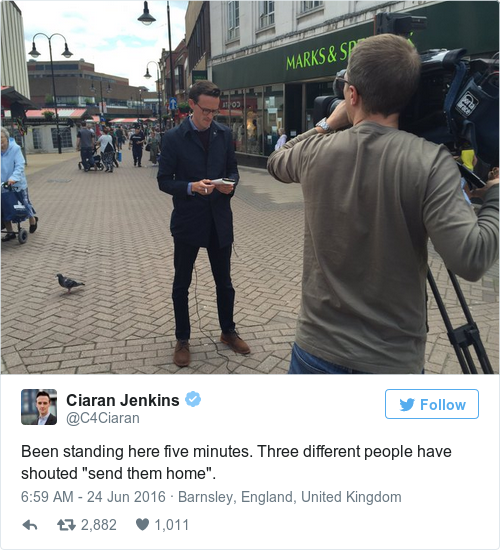 Channel 4 reporter Ciaran Jenkins said that just hours after the referendum results were announced, three different people shouted ‘send them home’ while he was reporting. “Long after the political bus moves on we leave problems on our street,” she told Sky News. I’ve spent most of the weekend talking to organisations, individuals and activists… who monitor hate crime, and they have shown some really disturbing early results from people being stopped in the street and saying look, we voted Leave, it’s time for you to leave. Email “Wave of hate crime and racist incidents following Brexit result”. Feedback on “Wave of hate crime and racist incidents following Brexit result”.